These colourful uniforms originated during the days of set battlefields where the dense smoke, generated by guns firing black powder, rendered many parts of the battlefield totally or partially invisible to the commanders, and, in many instances, making soldiers unable to see each other. (2) These conditions gave rise to the idea of employing coloured uniforms which would make the soldier more visible to his commanders and fellow soldiers. These uniforms would also facilitate the identification of the enemy, as in many instances the colours and style of uniforms differed from one country to another. In most armies, different colours and colour combinations were also employed to distinguish one regiment or corps from another. Attractive, colourful uniforms also made the ordinary soldier more accepted as soldiers were honoured as heroes and the vehicles of national aspirations of those countries striving to attain national unification and international recognition by means of the military might that they wielded. The uniform not only met military demands, but also had important psychological values and implications. An outstanding example of this was the use of the red tunic by the British infantry to overawe their opponents. (4) It is important to remember; however; that the functional combat uniform of one generation becomes the impractical ceremonial uniform of the next. The first military uniform worn by gunners of the Zuid-Afrikaansche Republiek (ZAR) was adopted by members of the Batterij Dingaan. This battery embodied the first attempt at forming a permanent, structured artillery force which may be seen as a forerunner of the Staatsartillerie. The uniform was developed under the direct influence of Captain Otto Riedl, who had been recruited in Germany in 1874 by President T F Burgers while purchasing artillery pieces for an intended artillery corps in the Zuid-Afrikaansche Republiek. 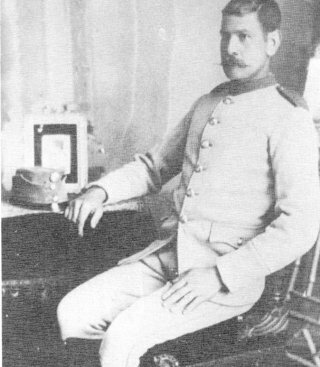 (5) In 1875, Riedl was duly appointed by the President with the rank of captain to assist in the organisation and development of a permanent artillery corps for the Zuid-Afrikaansche Republiek. After the British annexation of the Zuid-Afrikaansche Republiek on 12 April 1877, Batterij Dingaan was disbanded. Serving members joined the three British volunteer corps that had been created by Colonel Ignatius Ferreira to assist the British garrison with the defence of Pretoria. (6) Many of the men who joined these units did so without any feelings of guilt, as they were foreigners who had originally been recruited into the Batterij Dingaan to form the nucleus of a permanent military force. It was common practice for soldiers to serve in foreign armies and this contradicts the allegation that these men were mere mercenaries. As the state which had employed them had ceased to exist, they were forced to seek employment elsewhere. The practice of recruiting foreigners had been followed due to a lack of adequately trained men in the Zuid-Afrikaansche Republiek. 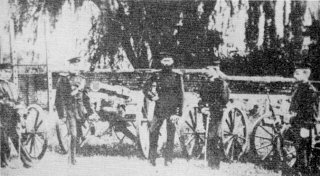 Prior to the formation of Batterij Dingaan, artillery had been organised on the model of the voluntary commandos which formed the backbone of the military force of the ZAR. The full dress uniform of the Batterij Dingaan consisted of a dark blue, double-breasted tunic with black velvet facing, red piping and smooth brass buttons. (7) Officers’ rank insignia, in the form of six-pointed metal stars, was worn on the collar and was consistent with Dutch/German and Austrian influence of the period. (8) The stars were made of either solid metal or embroidered silver thread. Non-commissioned officers’ rank was indicated by inverted chevrons on the upper-arm. The decorative shoulder-strap, shoulder tabs and cap were also fashioned on the Dutch/German style of the period. The trousers had a red band, extending down the side of each leg which matched the red piping on the tunic. In accordance with the Dutch/German influence of the period, the cockade on the cap would most probably have been in the colours of the Zuid-Afrikaansche Republiek. (9) The illustration of Captain Otto Riedl in the full dress uniform of the Batterij Dingaan indicates further consistencies with certain German, and more specifically Dutch, influences. The combination of blue, black and red piping is consistent with the Dutch artillery uniform style of the period. 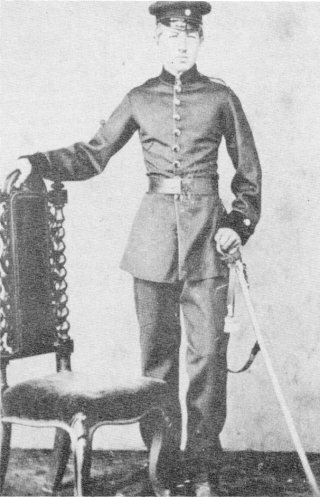 (10) Captain Riedl’s sword differs from the swords worn by the other members of the Batterij Dingaan, which are all of the 1871 German Artillery Officers’ sword pattern, while it appears that Captain Riedl is following the European practice of wearing an ancestor’s sword. (11) Positive identification of the sword is impossible due to the limited view of the sword (Figure 1). The undress uniform was worn on occasions which did not require the more formal full dress uniform. In the case of the Batterij Dingaan, it consisted of a blue tunic with a single row of smooth brass buttons, black facing, black velvet collar and red piping. A cap consistent with the Dutch/German style of the period with a cockade in the colours of the Zuid-Afrikaansche Republiek, a black leather belt and a sword based on the 1871 German Artillery Officers’ pattern is worn (Figure 2). The officer’s rank insignia consisted of six-pointed metal stars worn on the collar without the shoulder tabs of the full dress uniform. Non-commissioned officers wore inverted chevrons on the right upper-arm. Shortly after the conclusion of the British occupation of the Zuid-Afrikaansche Republiek in 1881, the Executive Council of the ZAR formulated Act No 4 of 1881, which instituted an artillery unit, the Artillerie Korps van de Zuid-Afrikaansche Republiek, which was similar to that of the Orange Free State. (13) Act No 5 of the same year instituted a police force, the Transvaalsche Rijdende Politie Korps which amalgamated with the artillery structure in 1882 under the name of Transvaalsche Artillerie Corps. (14) After several investigations and feasibility studies on whether to keep the combined unit or disband it, the artillery and policing functions were again separated and the unit became known as the Staatsartillerie van de Zuid-Afrikaansche Republiek with a strictly military function and structure. 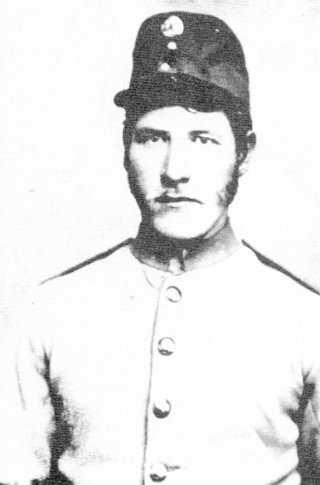 The uniform the men wore during the early 1880s was a mixture of military uniform and civilian clothing. (15) With the recruitment of foreign military personnel to assist in the formation and organisation of the artillery structure, it was inevitable that certain foreign influences would become noticeable in the structure and appearance of the unit. One of the foreigners who had been recruited to serve in the Staatsartillerie and who merits closer attention was Adolph Zboril, an Austrian, who had a late nineteenth century artillery background. 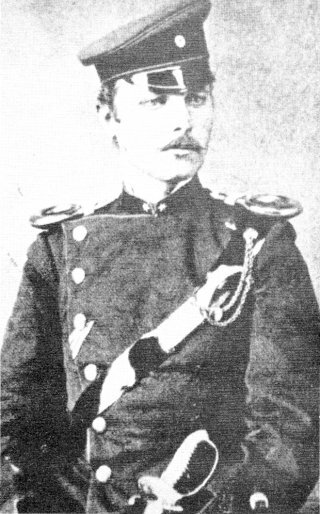 Zboril was appointed to the post of ‘Administrateur en Adjudant van het Rijdende Artillerie en Politiekorps der Zuid-Afrikaanschen Republiek’ on 1 July 1886 with the rank of captain. (16) In addition to the structural influences he brought with him, this man contributed much towards the development of the uniform of the Staatsartillerie. The sky-blue facings on this uniform may have been an adoption of the colours of the famous Austro-Hungarian 4th Infantry Regiment, the Hoch und Deutschmeister, or the adoption of the colours of the fraternity house, the blue Alemannia, of which Adolph Zboril was a member while at college, before emigrating to South Africa. (21) No documentation has yet been found to explain the exact reason for the selection of the sky-blue facing and this remains one of the many mysteries of our military heritage. A further possible reason for the adoption of sky-blue may have been that, as artillery was a technical arm of the defence force and the college which Zboril attended was a technical college, it was only logical that Zboril, being in charge of the Staatsartillerie, would adopt sky-blue as the corps’ colour. The field cap also resembled the design of the Austrian field cap, and corresponded to the colour of the caps worn by Zboril’s fraternity house. 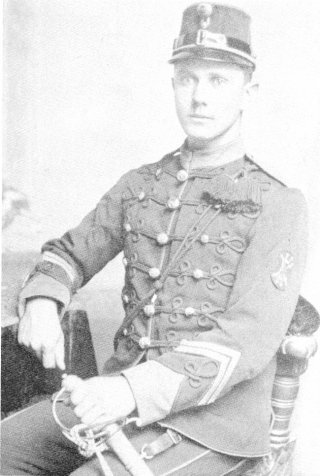 The summer and field dress uniform was a sand-grey drill which faded to almost white after exposure to the elements for a prolonged period of time (Figure 6). The uniform consisted of a jacket with a Prussian collar, brass buttons, riding breeches, boots and spurs. The headdress was a shako or forage cap of the same colour as the uniform with a black visor. The cap insignia design was identical to the Austrian badge, except that the initials F J (Franz Joseph) were replaced by the letters ZAR (Figure 7). 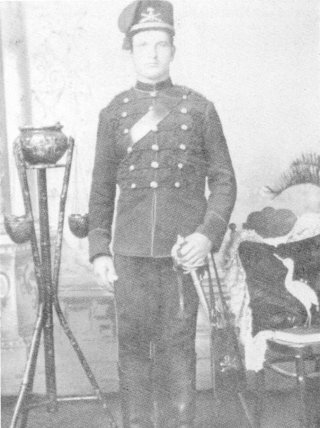 Rank was worn in the same manner as on the full dress uniform. The rank of junior officers was indicated by means of two (lieutenant) or three metal stars (captain) on the collar (Figure 10). The rank insignia of a major consisted of a single large silver star on a gold braided Prussian collar with two gold bands on the forearm. The lieutenant-colonel, the highest rank in the Staatsartillerie, wore two large silver stars on a gold braided Prussian collar with three gold bands on the forearm. 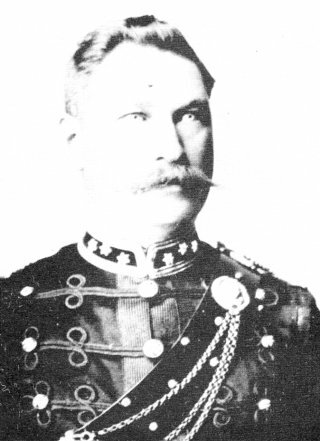 Warrant officers wore a single brass button on a plain Prussian collar (Figure 11). 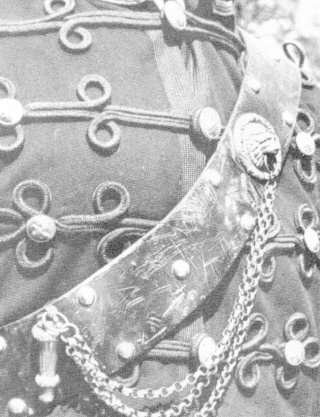 (30) Non-commissioned officers’ rank was indicated by means of gold braided chevrons on the forearms (Figure 12). The full dress uniform of the Garrison Artillery, which had been formed to garrison the forts in Johannesburg and around Pretoria, was also different from that of the Staatsartillerie. The tunic, although based on the Attila, fastened with toggle ties instead of buttons, the riding breeches were of a lighter colour than the tunic and rank insignia was worn with a grenade on the Prussian collar. Officers’ rank insignia was worn on the collar of the tunic and was indicated by six-pointed metal stars as described for the full dress uniform. Rank insignia of warrant officers was indicated on the collar by a large brass button and non-commissioned officers wore chevrons on the forearms. The undress uniform of the Garrison Artillery was a light grey jacket with breast pockets, a single row of plain brass buttons and a grenade on the Prussian collar in the case of other ranks. Officers wore a grenade on the collar alongside the stars which indicated rank. The undress uniform of the Garrison Artillery was thus completely different from the uniform of the Staatsartillerie. The service dress uniform was sand-coloured. At an undetermined period, this uniform was made from corduroy (Figure 14). The service dress, whether of corduroy or cotton, faded to an almost white colour after being exposed to the elements for a prolonged period of time. The headdress, worn as part of the field dress, was a slouch hat which was pinned up on the right side. The only insignia worn by many gunners was the badge of the Staatsartillerie or a large title ‘SA’ which they used to pin up the raised flap. (35) The service dress was identifiable with the burgers in the commandos during the guerilla phase of the Second Anglo-Boer War (1899-1902). The service dress included a 7 mm Mauser carbine whilst officers wore binoculars, a pistol and a sword. The uniform of the Staatsartillerie assisted in forging the men into a corps displaying excellent discipline and courage, which made the Staatsartillerie a formidable force. 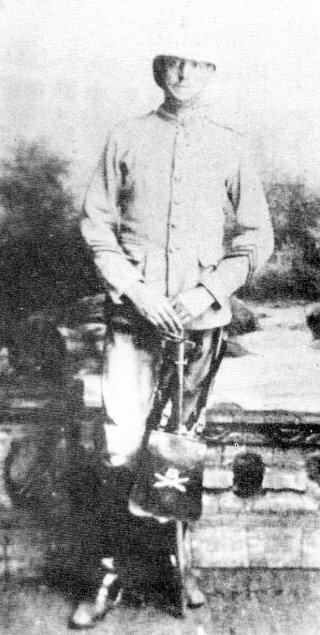 This courage and discipline stood the men in good stead during the many battles in which they participated during the Second Anglo Boer War. 1. J Mollo, Military Fashion (London, 1972), p 138. 2. J Shilds, Armies and Warfare in Europe (Manchester, 1982), pp 73-74. 3. J Mollo, Military Fashion (London, 1972), p 136. 4. M Barthorp, British Infantry Uniforms (London, 1982), p9. 5. D J Haupt, ‘Die Staatsartillerie van die Suid-Afrikaanse Republiek’ (Unpublished MA Thesis, University of Pretoria, 1946), p3. 6. O J O Ferreira, ‘Die Staatsartillerie van die Zuid-Afrikaansche Republiek’ in Militaria (6/2)1976, p 3. 7. O J O Ferreira, ‘Die Staatsartillerie van die Zuid-Afrikaansche Republiek’ in Militaria (6/2)1976, p 3; South African National Museum of Military History Archives, Johannesburg: File 355.31 (68) Transvaal Forces Formed. 8. Personal interview: B S Timmins, Curator of Insignia, South African National Museum of Military History, Johannesburg, 19 April 1990. 9. Personal interview: H R Paterson, Curator of Uniforms, South African National Museum of Military History, Johannesburg, 19 April 1990. 10. 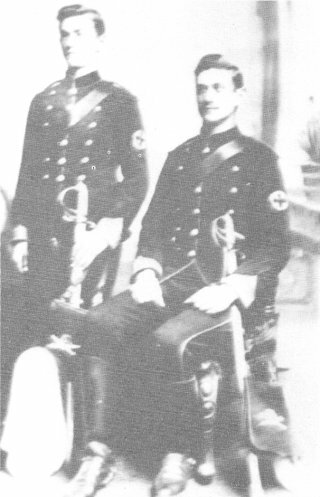 R Knötel, H Knök;tel and H Sieg, Uniforms of the World. (London, 1980), p333. 11. Personal interview: D W Aitken, Curator of Edged Weapons, South African National Museum of Military History, Johannesburg, 18 June 1990. 12. South African National Museum of Military History Archives, Johannesburg: File 355.14(68) (Staatsartillerie), figure 214. 13. D J Haupt, ‘Die Staatsartillerie van die Suid-Afrikaanse Republiek’ (Unpublished MA Thesis, University of Pretoria, 1946), p4. 14. D J Haupt, ‘Die Staatsartillerie van die Suid-Afrikaanse Republiek’ (Unpublished MA Thesis, University of Pretoria, 1946), p 4; O J O Ferreira, ‘Die Staatsartillerie van die Zuid-Afrikaansche Republiek’ in Militaria (6/2)1976, p 4. 15. D J Haupt, ‘Die Staatsartillerie van die Suid-Afrikaanse Republiek’ (Unpublished MA Thesis, University of Pretoria, 1946), p52. 16. 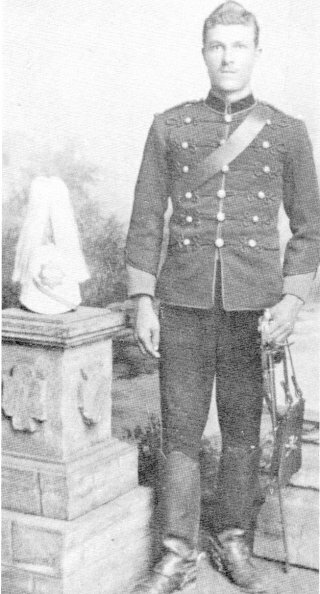 E A Schmidl, ‘Adolph Zboril – An Austrian Officer in the Transvaal Artillery’ in Militaria (18/2), 1988, p47. 17. O J O Ferreira, ed, Geschiedenis Werken en Streven van S P F Trichard. (Pretoria, 1976), p81. 18. 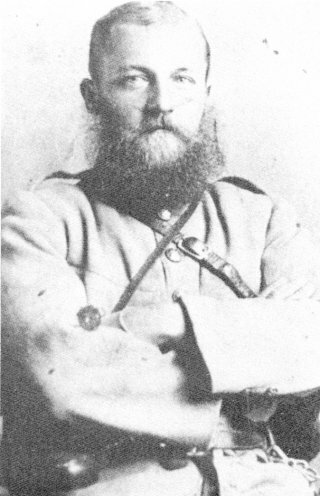 E A Schmidl, ‘Uniforms of the Boer Forces, 1899-1902 (2)’ in Military Illustrated, no 26, July 1990, p 22. 19. R H Rankin, Military Headdress: A Pictorial History of Military Headgear from 1660-1914. (London, 1976), p9. 20. South African National Museum of Military History, Johannesburg: 1184, Uniform, 1890. 21. E A Schmidl, ‘Adolph Zboril – An Austrian Officer in the Transvaal Artillery’ in Militaria (18/2), 1988, p51. 22. 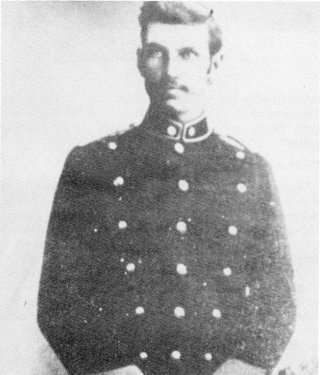 E A Schmidl, ‘Uniforms of the Boer Forces, 1899-1902 (2)’ in Military illustrated, no 26,July 1990, p 22. 23. E A Schmidl, ‘Adolph Zboril – An Austrian Officer in the Transvaal Artillery’ in Militaria (18/2), 1988, p51. 24. South African National Museum of Military History, Johannesburg: 27474, Buttons, 1890. 25. South African National Museum of Military History, Johannesburg: 1183, Officer’s Pouch, 1890. 26. South African National Museum of Military History Archives, Johannesburg: File 355.14(68) (Staatsartillerie), Annexure 13. 27. South African National Museum of Military History Archives, Johannesburg: File 355.14(68) Staatsartillerie, Annexure 6. 28. South African National Museum of Military History Archives, Johannesburg: File 355.14(68) (Staatsartillerie), figure 14; DJ Haupt, ‘Die Staatsartillerie van die Suid-Afrikaanse Republiek (Unpublished MA Thesis, University of Pretoria, 1946), p57. 29. G Tylden, ‘Korps Staatsartillerie’ in The Nonqgai, December 1946, p 1547. 30. D J Haupt, ‘Die Staatsartillerie van die Suid-Afrikaanse Republiek’ (Unpublished MA Thesis, University of Pretoria, 1946), pp 53-56. 31. South African National Museum of Military History Archives, Johannesburg: File 355.14(68) (Staatsartillerie), Annexure 13. 32. South African National Museum of Military History Archives, Johannesburg: File 355.14(68) (Staatsartillerie), Annexure 13; O J O Ferreira, ‘Die Staatsartillerie van die ZAR’ in Militaria (6/2), 1976, p 4. 33. South African National Museum of Military History Archives, Johannesburg: File 355.14(68) Staatsartillerie. 34. G Tylden, ‘Korps Staatsartillerie’ in The Nonqgai, December 1946, p 1-547. 35. South African National Museum of Military History, Johannesburg: 733-5, Staatsartillerie badge, 1895.